Oh man, games this weekend were intense! We knew the games were gonna be good, but they were even better than expected! Friday night we had a crowd of 4400! It was so loud and so crazy (just ask Evan!). BYU dropped the first game and then never looked back. They took the next 3 games to win the match! It was so exciting! Reed played awesome and had a great dig on match point! Saturday had a smaller crowd, but the energy was still great. They team played pretty well, but dropped the match in 4 sets. Dang. It was really frustrating because we totally out played them and almost all of our stats were better. The guys just made costly mistakes at the wrong time. But the season is still early and we have a lot more volleyball! Reed had another really great game. He had a career high 69 sets! Bring on the Bruins! We didn't get very many pictures this week, but I love this one of Evan and his cousin, James. James really loves Evan so much. He came and sat next to Evan and asked me to take their picture...but Evan wanted to stay on Mom's lap! 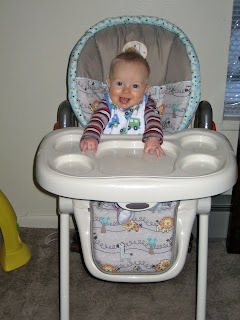 And here's Evan enjoying his new high chair...look how little it makes him look! 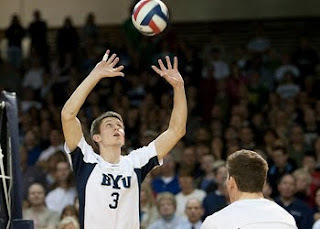 This last weekend was the BYU Men's Volleyball team's home opener! I have been so excited for season to start! I was pretty nervous about how Evan would handle all the noise and craziness, but he handled it all very well. The 2nd night he even fell asleep during the first game while sitting on the front row! Evan also had his very first interview! Reed's brother works in the media department, so he told the interviewer guy that my parents really wanted to see Evan on TV. So he came and got us during a timeout and Grandma Jo got what she wanted! The Cougars played really well. They swept Pacific both nights! And the crowd was so awesome Friday night-they had over 4,000 people there! It was a lot of fun. Reed started both nights and did great. And now, here are the pictures you've all been waiting for...Evan in is jersey! Our little family after a big win! For those of you in town, BYU will be playing #3 Stanford at home this Friday and Saturday night at 7pm. For those of you not close by, the games will be broadcasted live on BYU-TV both nights. Should be some good volleyball! 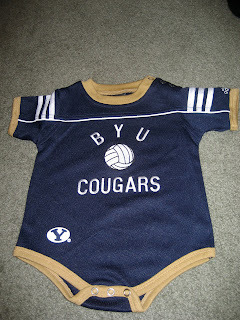 Go BYU! It's volleyball season! We are so excited! Last weekend the Cougars played in a tournament in Santa Barbara and did very well. The #6 ranked Cougs beat #2 UC Irvine (the defending national champions) and #8 UCLA. They ended up losing to CSUN in the championship game, so they took 2nd in the tournament! Not a bad way to start the year! This weekend is their home opener against Pacific. So come see us Friday and Saturday night at the Smith Fieldhouse at 7 if you're around! Can't wait to see Evan wear this for the first time...we've waited so long! So I saw this on my friend Lisa's blog and thought it was such a fun idea. So here it is! We are becoming Craig's List Pros! This year we got Evan's crib with a new mattress for an awesome deal and we just recently got a FREE dresser! We traveled far and wide to many exotic destinations. They include: Rexburg (Idaho), Las Vegas (Nevada), Yellowstone (Wyoming), Chino Hills (California), and Richland (Washington). Come on now, I was pregnant. But let's not kid ourselves- how different would this list be if I wouldn't have been pregnant? We moved across the border...or just University Ave. We are loving our new home that features 2 bedrooms, a fireplace, and a park in our backyard. 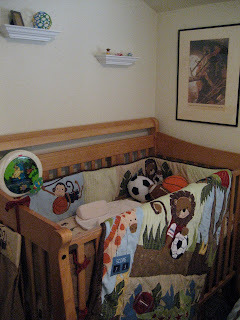 Evan is going to love all this room once he becomes mobile. I quit my job to stay home with the little guy. It was pretty nice to have a steady income, but it's not worth it. The Lord has blessed us so much to make it possible. I miss all the friends I made while working at Grandview, but I still get to see them when I take Evan in for shots! We bought a new car! Ok, not really, we're just too lame to think of 10 cool things we did last year. Reed had another awesome volleyball season in 2009. Not only was he the poster boy, but he was voted co-captain as well. He also was named to the Academic All-MPSF team. The Cougars finished the season 17-13 and with a 7th place national ranking. One of the highlights of the season was that he ONLY missed my birthday this year (so far he's 0-2 since we've been married) Click here to see more of his stats. We celebrated our 2nd anniversary! Seriously, being married to Reed is the best. He was such a good helper when I was pregnant...and still is now that I'm not. We have so much fun together and I couldn't ask for a better father for my little one. And hello-did you see his muscles on the vball poster?! Our biggest feat of the year was Evan beating meningitis. When he was only 6 days old we took him to the ER. We had no idea what we were in for. No doubt August 3rd was the longest and hardest day of our lives. We were so blessed to be able to stay at the hospital here in Provo and that Evan started receiving treatment so soon. We were able to bring him home sooner than expected while finishing his antibiotics. Evan sure gave us a good scare! And our top play of 2009...of course the birth of our son, Evan! 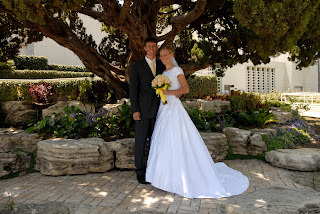 He joined us in Provo on July 28th weighing in at 7 pounds, 8 ounces. He has been such a fun little guy and we just love him so much. His perfect little smile just melts our hearts and we just can't get enough of his giggles. And...today we found his first tooth!